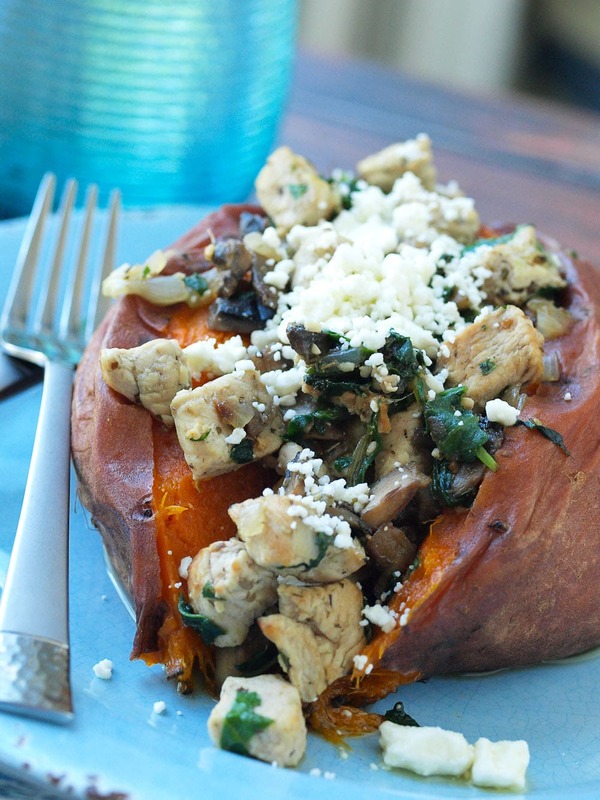 This Chicken, Spinach, Mushroom, and Feta Stuffed Sweet Potato recipe makes a healthy and filling dinner! How many ways can I stuff a sweet potato? Let me count the ways. I can stuff it to the depth and breadth and height my soul can reach. And then I keep on stuffing it. Sweet potatoes are meant to be stuffed. Take a perfectly cooked sweet potato, add a tasty filling with more vegetables and protein, and boom. You’ve got a complete meal. I tried something different with this stuffed sweet potato recipe. A reader recently commented that she cooks her sweet potatoes in the crockpot. Woah. That changes everything. I thought, well what if I cook the tators in the crockpot and then have a super quick filling? What then? The result was having a dinner I could get home and have ready to eat in less than 20 minutes. Cooking the sweet potatoes in the crockpot doesn’t make for crispy skin like if you’d baked them in the oven. A perfectly acceptable trade-off, in my opinion, to have the longest cooking part done at dinner time. If you are a vegetarian, make a simple swap of chickpeas for the chicken. They will add protein and work nicely with the other ingredients. If you’re dairy-free, simply leave the feta off or sprinkle the filling with nutritional yeast. This recipe is naturally gluten-free. Make this recipe work for you because it’s a great meal. One stuffed sweet potato is about 350 calories, with 32 grams of carbs, 12 grams of fat, and 25 grams of protein. 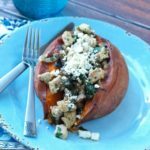 Use your Crock-Pot to make the sweet potatoes and then dinner time is super quick for these Chicken, Mushroom, and Feta Stuffed Sweet Potatoes! Wrap your sweet potatoes in tin foil. Place them in the crockpot and cook on low 7 hours. About 20 minutes before you want your sweet potatoes ready, heat the oil in a large skillet over medium high heat. Add the onion, chicken, mushrooms, salt, pepper, and oregano to the skillet. Cook until the mushrooms have released all of their liquid and it has mostly all evaporated, about 6 minutes. Add the spinach and garlic and cook another minute or so until the greens are wilted but still bright green. Remove from the heat. Open each sweet potato and fill it with 1/4 of the filling. Top with 1 ounce of feta cheese. If you love stuffed sweet potatoes as much as me, try these Southwest Stuffed Sweet Potatoes or these Balsamic Roasted Grape Stuffed Sweet Potatoes. I’m a master sweet potato stuffer! This looks delicious stuffed with some of my favorite foods. 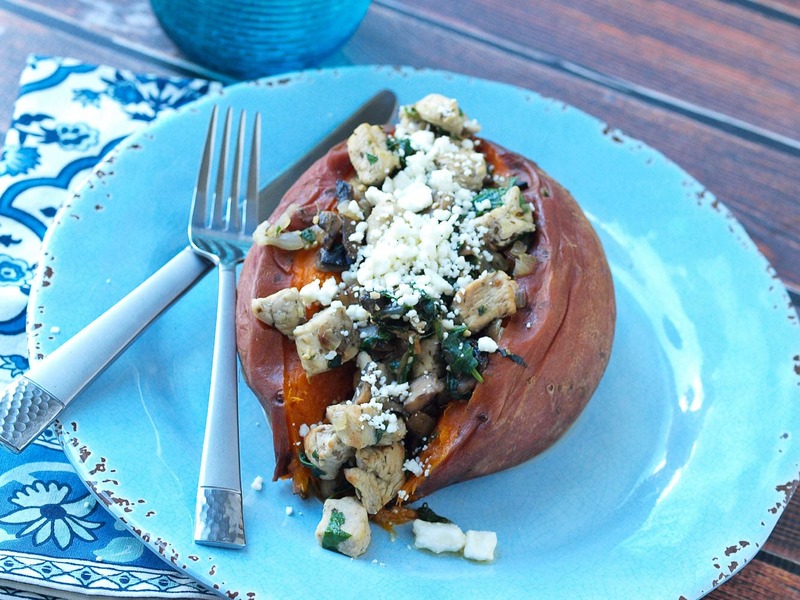 Stuffed sweet potatoes are such perfect meals! Thanks, Jill. I usually put my sweet potatoes in the microwave and use the “baked potato” setting. They were fine before the filling was done? Mine doesn’t look as pretty as the picture on here, but it sure did taste amazing and it’s my husbands new favorite meal! Can I bake the sweet potatoes instead of using the crockpot, if pressed for time? Yes, you can definitely bake the sweet potatoes instead of using the Crock-Pot. You can leave the mushrooms out all together, or sub another vegetable like red bell pepper or zucchini. A lot of different vegetables will work well! How many sweet potatoes do I need for this recipe? Didn’t see it in the recipe list. Wow–that’s so strange that’s missing. You need 2 large sweet potatoes! Recipe is kind of confusing; it says to top each potato with 1 ounce of cheese. Yet you have 4 ounces of feta and only 2 potatoes. Can I cut back on the cheese because of the sodium or replace with another cheese? 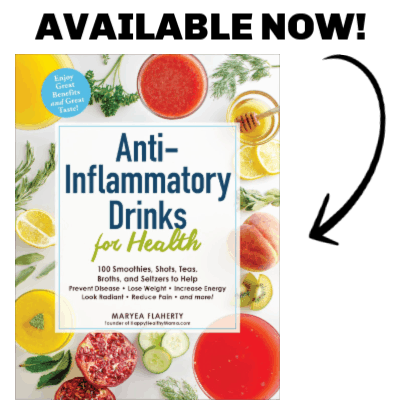 You’re right–sorry about that! It is actually supposed to be 4 sweet potatoes, so the 1 ounce per potato is correct. I am fixing that now!